Some information, gleaned from the bourgeois press, about recent events in Karachi. KARACHI – Riots broke out in different parts of the city on Wednesday over unabated electricity loadshedding, as a tug-of-war between CBA union and administration of KESC has led the consumers of the utility to misery. According to details, the strike of Karachi Electricity Supply Company (KESC) employees has badly affected the supply of electricity in the city. The KESC workers are not removing technical faults in time in different parts of the city. The loadshedding duration has reached to 8 to 12 hours in different parts of the city while 24 to 36 hours power failures have also been witnessed in different areas. The citizens are also deprived of water as Karachi Water and Sewerage Board claimed that pumping station were closed due to power failure. The areas including Gulshan-e-Iqbal, Tariq Road, Gulshan-e-Maimaar, Sohrab Goth, Surjani Town, New Karachi, Kornagi 3 and 5, Nazimbad No 7, and Malir are the worst hit areas and people there came to streets, burnt tyres and resorted to intense aerial firing causing an halt to all private and commercial activities in these respective areas. He said that company’s assets were in trillions of rupees, whereby it could be sold out in Rs 16 millions and twenties department are being tried to have been outsourced. He termed that it is corporate techniques to have the city paralysed, as the load shedding time is accumulating and industries are being shifted from Pakistan to other countries. However, according to KESC press release, the KESC employees could not attend to faults for the past three days since its various offices had been occupied by protesting workers and their aides. The release further said this certainly required the government’s intervention and support of the law-enforcement agencies, adding that the government agencies should act fast and swift in order to help the utility resume its normal power supply functions and maintenance and repair work in the metropolis as soon as possible. The Karachi Electric Supply Company on Tuesday failed to restore power supply to many city areas even after a passage of over 36 hours as it remained engaged in a tug of war with workers protesting against their placement in a surplus pool. As the KESC claimed that it could not attend to faults for the past three days since its various offices had been “occupied” by protesting workers and their “aides”, power consumers wondered as to how the power utility was implementing the loadshedding schedule across the city, and that too in such an effective manner. The top management of the KESC appears to have enlisted the support of Sindh Governor Dr Ishratul Ibad Khan, who ordered the law-enforcement agencies to get the KESC installations vacated from “occupants”. The KESC management demanded that the governor direct the law-enforcement agencies to protect its assets, offices, equipment and employees from what it described as the “hooliganism” of attackers. Dr Ibad directed the Rangers and the police to take appropriate action against those responsible for causing damage to the power utility’s installations. He said that strict punitive action should be taken against those elements that were causing difficulties to the people. The KESC on Tuesday appreciated the governor’s role and said that a private company could not be expected to resist “armed attacks by organised gangsters”. This certainly required the government’s intervention and support of the law-enforcement agencies, it said, adding that the government agencies should act fast and swift in order to help the utility resume its normal power supply functions and maintenance and repair work in the metropolis as soon as possible. It claimed that the “union’s violent sabotage action is in clear violation of trade union ethics, city`s peace and the orders of the Sindh High Court which had already declared the union`s protest illegal and unjustified”. “No employees have been sacked and no such action had been taken to demand any kind of protest, let alone a series of criminal and disruptive attacks which have completely disturbed the power supply and maintenance system in the whole city. The union people have hugely crossed their limits,” according to the KESC press release. “Armed masked men have been attacking the utility`s offices, ransacking office equipment and vehicles, assaulting its officers, engineers and employees, and have completely blocked the repair, maintenance and other work on public requests and complaints for three days,” it added. Giving details, it stated that armed masked men attacked three assistant executive engineers opposite Korangi Industrial Model Zone IBC on Tuesday afternoon to stop them from working while they were about to enter their office. The general manager of the IBC Gulistan-i-Jauhar was also attacked outside his office but he had a narrow escape. Work was also blocked in the SITE area, including the power supply to industrial units, since morning as armed men had forcefully closed all KESC offices in the SITE area. They also forcefully closed C Division offices of the KESC in Hadi Market Centre and a deputy general manager in the KESC`s Gadap office was forced to vacate his office on Monday at gunpoint. Five officers who intervened were beaten up with iron rods. A total of 312 cable faults could not be repaired throughout the city because of the sabotage, said the KESC statement. However, the protesting workers of the KESC rejected the management`s allegations saying that neither they were on strike nor they had stopped anyone from working. They reiterated their stance that the management was not taking any work from them and had hired people to do their job who were occupying their places. KESC accuses protesting workers of disrupting power supplyThe Karachi Electric Supply Company on Monday alleged that its workers, who are observing a strike under the aegis of the power utility’s Collective Bargaining Unit (CBA), have resorted to sabotaging the power supply to a number of areas. A statement from the company said that the workers, while demanding proper job assignments for around 4,000 employees, sabotaged supply systems and seriously disrupted routine operations as well as the public services provided by the KESC. As workers continued with their hunger strike outside the Karachi Press Club (KPC), the suffering of KESC consumers multiplied as on one hand they were forced to endure prolonged loadshedding, while on the other, faults and tripping of the distribution system could not be rectified. The power utility alleged that workers were stopped from performing their duties by the protesting elements within the company. Public service operation and the dealing of various offices and centres of the KESC were also suspended, causing a tremendous amount of inconvenience for power consumers. The protesting KESC workers, under aegis of their various representative associations including the CBA, have been demanding proper assignment of duties and work positing to around 4,000 workers of the power utility. These workers had earlier been sacked by the KESC as part of its planned downsizing, but were later reinstated after a protest drive. In a statement, the KESC accused the CBA of deliberately switching off substations and other supply networks, causing blackouts in several areas of the city including SITE, Lyari, Old Town, Mangho Pir, Orangi, New Challi, Defence, PECHS, Gurumandar, as well as Mazar-e-Quaid. The City Courts also suffered a prolonged power outage. The statement said the protestors also sabotaged 10 high-tension cables feeding power to around 20,000 houses of PECHS, Garden and adjoining areas. Since Saturday morning, the KESC has been facing acute problems with drivers and MTLs (KESC repair vehicles). According to sources privy to the workers’ protest movement, the leaders and labourers of the power utility stepped up their demonstrations and also extended their actions to the company’s offices after some of the protestors, who were on hunger strike, were denied KESC’s health facilities to treat their deteriorating condition. Meanwhile, the President of the KESC Labour Union flatly denied the allegations that the CBA or other leaders had called for workers to boycott their official duties and assignments. “We have been sitting outside the Karachi Press Club and observing a hunger strike to press for our demands. As a show of solidarity with their colleagues, other workers of the KESC have started converging on the Press Club,” said the leader of the CBA. He added that the workers started coming to the Press Club as they were concerned about the health of their representatives and leaders who were on hunger strike for the last few days. He said that there was no call to stop work and operations in the power utility, nor was there any attempt to sabotage substations in various parts of the city. “We have been just sitting outside Press Club so it is impossible for us to carry out such extreme actions,” said Baloch….. The power utility said that since the morning of May 9, 2011, CBA Union office bearers and activists, along with some external allies, illegally blocked the utility’s operational activities in various parts of the city. The miscreants forcefully stopped on-duty staff from work, halted maintenance and did not allow on-duty employees from using office equipment and vehicles at most of the utility’s offices, bringing KESC’s essential operations to a standstill across the city. KARACHI: At least five policemen, including the Superintendent Police (SP) Keamari Town Tariq Mughal, were injured during a protest demonstration staged by the flood affectees within the jurisdiction of Mauripur police station on Monday. The protesters, who took to the streets to express their growing disenchantment against the unfriendly attitude of authorities, scuffled with the police personnel. They burnt tyres on the road and pelted stones on policemen and vehicles at Maripur Road, which resulted in injuries to five policemen, including SP Keamari Town, Sub-Inspector Azam Khan, Head Constable Mumtaz, constables Kumar and Naeem. When contacted, SHO Mauripur Nasrullah dispelled the impression that the protesters were flood affectees, saying although the registration process of flood affectees was completed, the influx was still in progress from rural Sindh. KARACHI – Two minors sustained injuries while unidentified miscreants attacked a traffic police check post when the residents of Maripur area came to streets over unabated electricity loadshedding. The protests have been continued in different areas of Karachi. The areas where the riots broke out included Gulshan-e-Iqbal, Mari Pur, Musharaff Colony, 500 Quarter, Saddar, M A Jinnah Road and others commercial areas of the city, where the angry shopkeepers and residents blocked roads and burnt tyres while pelting the passing vehicles with stones. During protest at Maripur, the law enforcement agencies used baton charge over the residents and dispersed them. The officials of law enforcers claimed that they could not assure the protestors because it was a big issue of the city, however they were creating law and order situation so they had have to use baton charge to control the situation. At MA Jinnah Road the shopkeepers of the area blocked main thoroughfare for several hours. The protestors also burnt tyres and staged sit-in protest. They claimed the private utility had ruined all business. The residents of Gulshan-e-Iqbal said that previous night, the PMTs of the areas caught fire, two fire tenders doused the fire no KESC officials had reached there for the last 18 hours to fix the faults. They said they continued roaming the complain centre of KESC but they did not pay heed, adding it was the area of congested apartments and due to hot weather the KESC had led them to hell. Meanwhile, MQM MNAs on Wednesday flayed the power outages in Karachi, Hyderabad and other parts of the country. The MNAs termed long hours of loadshedding as gross injustice to the citizens. In a joint statement the MQM MNAs said that dispute between the management and workers of KESC had made the life Karachites miserable. KARACHI – The violent protests against prolonged power outages continued in various parts of the city on Saturday, as enraged people took to streets, burnt tyres and blocked vehicular traffic to vent out their anger against the KESC. On Saturday the temperature in the city was recorded at 44 degrees centigrade and the long power breakdowns in number of localities caused acute shortage of water. The residents of small flats/apartments are the worst sufferers of unending loadshedding and unattended fault. Sizzling temperature on Saturday and power outages busted the temperament of the citizens as protest remains continued in various areas where enraged people are looking for the facilitators of KESC disappeared along the power to avoid the harm. The areas, where the riots and protest broke out including Nazimabad, Pak Colony, Purana Golimar, Rashid Minhas road, Kharadar, Mangopir, MT Khan Road, these areas mostly belonged to the lower class and slum areas of the city, where the angry youth along with women and children took out to streets and staged noisy protest against the inefficiency of the private utility. They said the administration of the KESC should immediately reinstate the employees if they want to save power consumers from more misery. It is pertinent to mention here that the offices of Abdul Sattar Edhi across the city have been deprived of electricity for the last two days, and despite several complaints at KESC head office, the contractual employees of the utility could not restore the electricity causing the severe hardship for rescue services across the city. On the night between Friday and Saturday, the charged miscreant attacked the offices of the KESC and tried to burn them. They also set ablaze the office of the KESC at Habib Bank Chowrangi and lit three vehicles and pelted passing vehicles with stones. The phase of power riots has already started in Karachi as almost every locality has been witnessing a law and order situation owing to prolonged power outages. It is feared that the magnitude of these riots will increase in the coming days as stabilization in power generation and proper distribution is still a far cry. But there seems to be no threat to the government of Chief Minister Syed Qaim Ali Shah since no major political party is willing to take advantage of the situation. Most of the parties are in the coalition and those which are not in the government do not have any political position to launch an anti-government movement on this issue. The opposition parties could exploit the situation but they just do not go farther than lodging small protests on the issue and the people know that the ruling parties would manipulate the situation whenever they apprehend that the situation was going out of their control and the opponents could take advantage of the issue. So there is no threat to the PPP-led Sindh government because every ruling party has a share in the power utility owned by a Saudi investor. There are reports that the power company has hired the relatives of the ministers, MNAs and MPAs of the ruling parties on handsome salaries and packages and even the workers of the ruling parties have been given jobs in the power utility. Definitely, the situation will not be difficult for the government of Qaim Ali Shah as well as for the foreign-based management which has been given the task to run the electricity system of this mega economic hub of the country. Transparency International claimed that the power crisis and subsequent disturbances in Karachi was a deliberate act to provide an opportunity to the government to take over the KESC and the aim of this plan was to earn billions. The TI blamed that the agreement between the government and the utility management has been kept secret and huge benefits must be going to those running the power utility. The CEO of the KESC happens to be so powerful that he refused to appear before the Senate Standing Committee on Power as well as the Standing Committee of the Sindh Assembly to share information about the power crisis in the provincial capital. The unions of the power utility have also lodged campaign against the management, as the power crisis further aggravated in the city. Taking advantage of the protest by the unions, the utility management shifted the blame on the protesting workers for the prevailing power crisis and persisting faults in distribution system. Not only the PPP but other parties have been backing this protest. The utility management had been citing shortage of furnace oil and gas as the reason behind load-shedding during the last two years and now it attributes power crisis to the protest by unions…. According to officials, Sindh government signed MoUs with a government-owned Korean company to generate 10000mw electricity for Sindh. Initially, the company will generate 2000mw in two years and its first project will be generating 200mw through windmill. The Sindh government is hopeful that the power crisis will come to an end after two years when the PPP will be completing its tenure in the government. The residents of different areas blocked the flow of traffic for hours following the unannounced loadshedding in their localities. They also burnt tyres and threw stones on passing vehicles to block the main Korangi Road in Zaman Town police precincts. They also chanted slogans against the Karachi Electric Supply Company and demanded authorities to take action in this regard. Police and rangers were called at the scene who later calmed the situation down following peaceful negotiations…. Meanwhile, several other protests were also staged in parts of city against power failure. On the other side, the spokesman of the utility in his press release said the Company has expressed great alarm at the miscreants attack at Bin Qasim Power Plant and SITE Grid Station Saturday morning and demanded immediate State security at all KESC power houses and grid stations to save Karachi from being led into complete darkness. He said more than 100 armed miscreants forced entry into Bin Qasim Power Station early this morning and took illegal control of the electricity generating installations. KARACHI: Following the strike call given by the Awami National Party (ANP) and endorsed by Jamaat-e-Islami, Punjabi Pakhtun Ittehad and Karachi Transport Ittehad against the Karachi Electric Supply Company (KESC), the social and business activities in the city remained partially suspended, while complete strike was witnessed in ANP-dominated areas. The city also remained tense as six persons, including two security personnel, were killed and 11 persons injured. The miscreants also set 10 vehicles on fire, creating panic in the city. Police officials claimed to have arrested over 60 suspects from the city for rioting and attacking law enforcers & citizens. Miscreants in ANP-dominated areas took to the streets since Thursday night and opened heavy gunshots. They also threatened shopkeepers to close their business or face dire consequences. The public transport also remained thin in various parts of the city including Malir, Banaras, Orangi, Quaidabad, Shah Faisal, SITE and Gulistan-e-Jauhar. The commuters faced trouble in reaching their destinations. Fuel and gas stations in these areas were also closed to avert any untoward incident. Incidents of violence and arson were also witnessed in these areas since Thursday night that left five people, including two security personnel dead and 11 others injured. Nine vehicles were torched in Sachal, Toll Plaza, Baloch Colony, Orangi Town and Gulistan-e-Jauhar areas. The riots began on Friday morning when armed men riding motorcycles and cars forced shopkeepers to close their shops in order to make the strike successful. Heavy contingents of Rangers and police were deployed in Sachal, Qasba, Quaidabad, Orangi and Shah Faisal areas to bring law and order situation in control. However, an armed clash between miscreants and law enforcers was witnessed in Sachal area that killed a Rangers man Mumtaz Ahmad, while two policemen Nawaz and ASI Khadim Hussain received bullet wounds in the similar incident. The victim, Mumtaz, who hailed from Rawalpindi, was deployed in 31 Wing of Sachal Rangers. Mobina Town police said unknown outlaws shot dead a 50-year-old Badal, son of Gul Muhammad near Mosmiat. A 20-year-old passerby fell prey to violence within the limits of Gulshan-e-Iqbal police. The victim, who was identified as Syed Ali Shah son of Sattar Ali Shah, received fatal bullet wounds and died on the spot. A man, Faisal Barohi, was also reported killed in a similar firing incident in the limits of Al-Falah police while a cop, who was injured in Banaras on Thursday night, succumbed to his injures during treatment at a local hospital. A police constable, Mukhtiar Ahmad, son of Kabeer Ahmad, was shot dead in Qasba Colony. The victim was the resident of Orangi Town No 10. Another passerby, Ramzan, 45, was shot dead near his house in Quaidabad where unidentified miscreants were trying to close a shop forcibly. Bahadurabad police have registered an FIR (35/11) against ANP worker Noor Khan and others for violence and attack on police station. GUJRANWALA: Frustrated with the increase in power outages, residents of several cities took to the streets in protest, a private television news channel reported on Monday. Angry protestors set ablaze Six GEPCO offices and a petrol station in Gujranwala while five people including a DSP and SHO were hurt during clashes between protestors and police. Protests continue on GT road and several areas of Gujranwala have been without power for the last 14 hours. Several people have been injured as protests have turned violent throughout the city. A police check post was also attacked following the arrest of several protestors. During firing by the police two people were injured. Protests are also taking place in Lahore for the second consecutive day. The city is experiencing 14-18 hours of loadshedding and this has also led to a water shortage. Loadshedding has also taken its toll on residents of Multan, Dera Ghazi Khan, Bahawalpur and other cities of southern Punjab. The situation is similar in Balochistan where several cities are without power for up to 18 hours. Over in interior Sindh and Karachi residents are living without electricity for at least 10 hours. Residents of the metropolis are left with no other option but to protest as the KESC claims that not enough electricity is being supplied from the national grid. In Khyber Pakhtunkhwa and FATA at least 14 hours of loadshedding is taking place leading to water shortage in several areas. Protesters who blame severe shortages on corruption attack electricity company property across country. 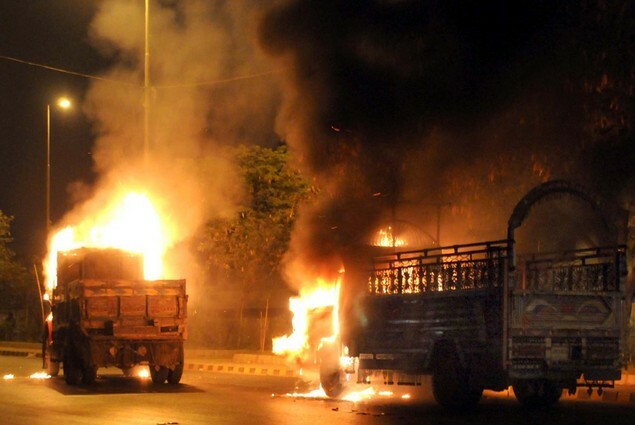 Pakistanis upset over severe electricity shortages have clashed with riot police across the country for a second day. Officials said mobs set fire to six electricity company offices and several rooms in a police station in Gujranwala city alone on Monday. There were also reports of attacks on electricty company property in other parts of the country. Some areas of Pakistan face power cuts for 18 hours a day. The government says it underestimated the country’s growth, but many citizens blame mismanagement and corruption for the shortages. The record loadshedding that has struck the nation with a vengeance these days has compelled the people to stream out into the streets in increasing numbers. In sheer desperation, they have been protesting for the past several days, not peacefully, not even just noisily, but in a riotous manner, demonstrating their anger at the authorities by burning a grid station, vehicles, tyres and buildings, pelting stones and damaging property and blocking main thoroughfares – anything that came their way became their target. Watching the scenes of violent and rowdy protests in the towns, which have been affected the most, it appears that the entire nation has unleashed its wrath at the government for its listlessness in the face of public suffering. As things threatened to go out of hand, the powers that be woke up to pacify the crowds, with the Prime Minister issuing orders for an immediate release of Rs 11 billion to the Ministry of Petroleum and National Resources to be passed on to the fuel supply and power producing companies to set the electricity generation process rolling. With the shortfall between production and consumption crossing 8,000MW and resulting in shutdowns of between 14 and 20 hours, it would have been unrealistic to expect that the situation would remain calm, even though many a critic has been taunting the Pakistanis with words like a “sleeping nation”. An outraged PML-N President Mian Nawaz Sharif not only assured the people that his party was with them, but also called upon the party workers to come out and join them in their protests. He asked for a timeframe for overcoming the power gap. Inside the National Assembly, both the PML-N and MQM lodged their strong protests and staged a walkout on Monday. Latest news indicates that all the PML-Q Federal Ministers have handed their resignations from the cabinet to their party head, as a show of dissatisfaction at the frustrating government failure to make this basic facility available to the people. It is a moment of serious reflection. The government is proving a disastrous failure in every field of its responsibility. Experts believe that given the will the power gap could have been bridged by now. Had the old generating units replaced or repaired, work on the planned power stations started and the hydel potential even partially utilised, the nation would not have been suffering from the woes of blackouts. The criminal neglect in ignoring the construction of big water reservoirs at suitable sites like Kalabagh is a major reason for the lack as well as high cost of electricity. National interests and, indeed, common sense demand that setting aside provincial and parochial biases, the Kalabagh Dam project is taken up without delay. The help of the Chinese, who are reportedly ready to augment our hydel production capacity, should be immediately sought. And work must begin straightaway on laying the required infrastructure for receiving natural gas from Iran.